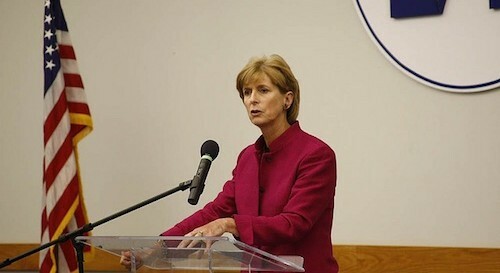 Former New Jersey governor Christine Todd Whitman (R), who headed the EPA under President George W. Bush, has written to President Obama's EPA head, Gina McCarthy, to argue that the EPA's proposed regulation to reduce the risks of explosions at U.S. chemical plants is too weak. Whitman writes that her purpose is "to urge the EPA to strengthen" its rule "to increase the safety of the American people," particularly by requiring numerous high-risk chemical facilities to move to inherently safer technologies (IST). But Whitman made clear in her letter to McCarthy that the new draft rule did not do enough to prevent future tragedies. "It would be most regrettable," she wrote, "if in the closing months of the Obama Administration EPA did not use the opportunity that President Obama's Executive Order provides to expand the use of IST, when economically and technologically feasible, to reduce the vulnerability of high-risk sites to terrorist attack and to better protect the American people in the event of either an accidental or deliberate release." In March I submitted a comment to the same EPA rulemaking process, co-authored with Lieutenant General Russel L Honore, US Army (Ret), the former commander of Joint Task Force Katrina, and Major General Randy Manner, US Army (Ret), former Acting Director and Deputy Director of the Defense Threat Reduction Agency. The generals and I argued, as Governor Whitman does, that U.S. chemical plants currently pose a serious national security danger. We warned that, while the Obama EPA's proposed rule includes important measures to improve emergency preparedness, even more essential is prevention of a chemical disaster in the first place. And in this regard, the proposed rule falls well short. But the strongest statement of the threat came from Senator Barack Obama in 2006, when, in advocating for stronger IST mandates, he called America's hazardous chemical facilities "stationary weapons of mass destruction spread all across the country." The EPA and the Obama Administration need to act on Senator Obama's stark concern, as Governor Whitman's strong new letter underscores.